What does the above statement mean. Think about it without Great Whitetail Deer information why would you think you can be good at going afield in the fall to harvest a Whitetail. Any other thing you do in life I would bet you learn how to do it right to succeed, the same applies to deer hunting and more so because of the great respect we have for them. I read lots of articles all year long, some that I like and some not. I also have trail cameras out all year long as well. I have tried so many but the best I have now are Browning. 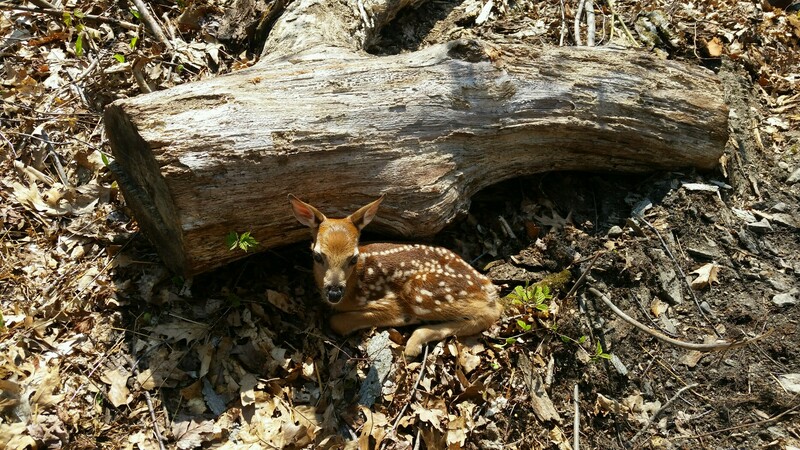 Below will be a picture of a fawn the forester I work with on my 300 acre parcel of hardwoods. We just finished work on 10 acres of food plots and a nice pond. Improve Whitetail habitat improves hunting. A new fawn could be as new as a week old. What a beautiful animal to find. Mom thought she was in a safe spot. 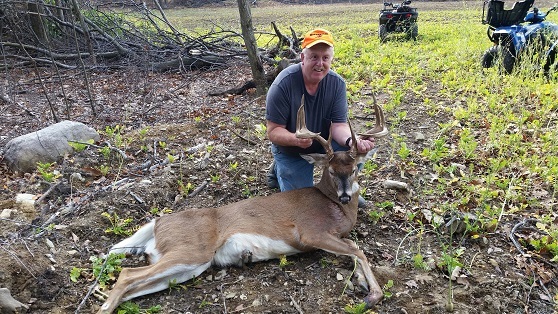 The buck harvested below was taken on the first day of gun season in the southern zone of NYS. He came into the food plot at 11 am. This is proof how food plots work so well, this is the largest buck we have ever taken on our property. This proves we know what we are talking about. I harvest a nice buck each year, sometimes with a bow and sometimes with the gun. I work hard each year to bring home some venison to eat. Understand it takes hard work and commitment to be successful hunting whitetail deer. It is also great times with friends and family. Nothing beats being outdoors year around. 5 1/2 year old 8 pt. 182 lbs field dressed. 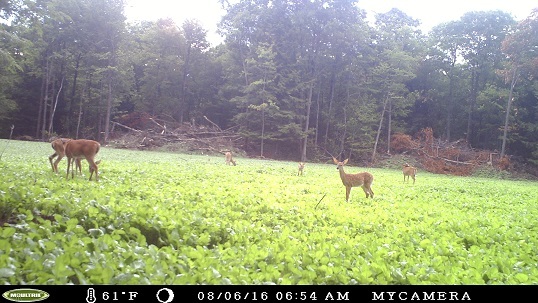 This is the value of food plots for sure. 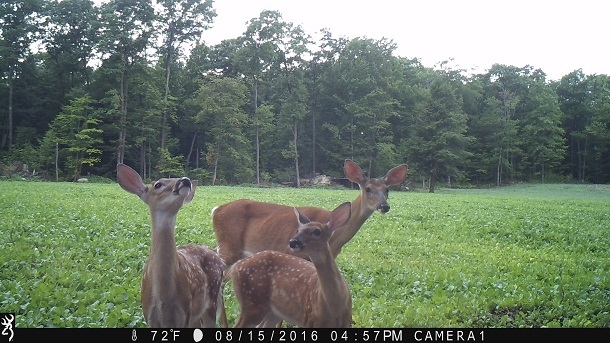 Whitetail Deer Fawns, Whitetail Deer Doe, checking out the camera on the food plot. The pictures above are from one of the Deer food plots we just added to our property, this one is 5 acres. You need food to attract and hold the deer on your property or hunting area if you lease. As you can see this does help with attracting and holding Whitetail Deer. All our work and forest management is done by Cory Figueiredo of Future Forest Consulting. You need to find and use a Forester to manage and guide you with the growth of your deer hunting property. On our property at this time we only harvest bucks. In the future we will be watching the buck to doe ratio very careful to keep our herd in balance to their food. 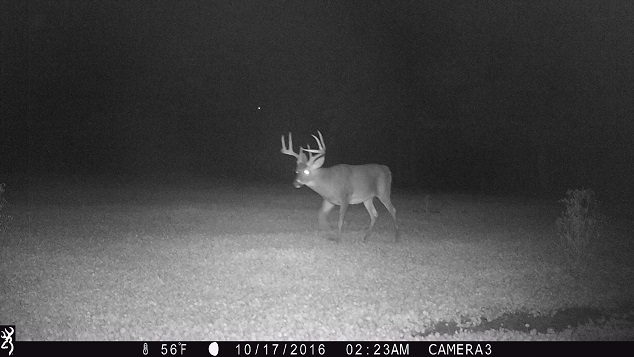 The buck pictured below showed up several times this season. I showed this picture to my friends hunting on our property. I asked them NOT to shoot this buck. Why you may ask, because I wanted to make sure he mated with as many does as possible to pass along his genes. We let this guy go in hopes he would make it into next season as well. This is how to improve your herds quality. Its not always about the trophy for the wall but improvement for the future of your property. Hunting Whitetail Deer is what a lot of hunters are looking for in this picture. I have done so myself in 1986 I took an impressive 14 point Whitetail that scored 139 1/8 and was taken with my bow. That deer made the NYS Big Buck Club and the Pope and Young record book as well. I only entered it into the NYS record book. Not being big on entering record books I did not send them the information. For me it is great to harvest a nice buck every year. I do so for the meat as I enjoy it very much and it is nice a lean, great for all kinds of cooking. Nothing like marinated back straps on the grill any time of year. This Fawn could be the next Trophy Whitetail Deer in your area. Learning about the behavior of white-tail deer begins with a good understanding of how whitetail fawns grow into yearlings and then adults. Does and bucks behave differently of course. 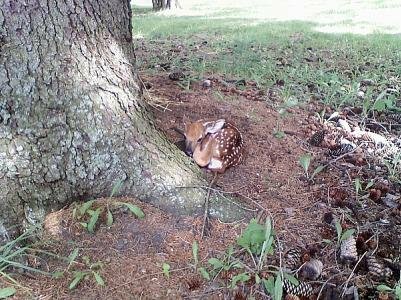 A whitetail deer doe will birth up to 3 fawns but most of the time they birth 2 or 1. Later in the summer they may then join a group of other does and fawns. 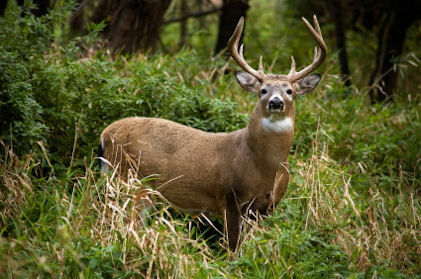 Whitetail deer are hunted mostly with rifles or bows. Bow hunting whitetail deer presents a hunter with fascinating challenges. But whether you hunt with a gun or a bow, there is a lot of whitetail deer information and deer hunting tips offered by professional and recreational sports persons, which can improve your chances at hunting success. 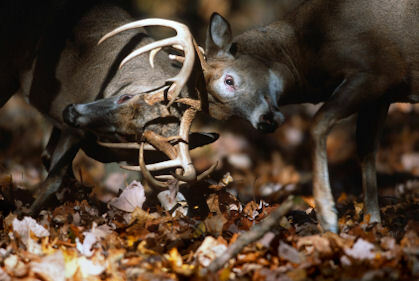 The wealth of whitetail deer information that's available reflects the popularity of the sport. If you are an avid hunter or photographer and want to make sure you are doing everything possible to experience successful whitetail deer hunts, you've chosen a great place to start expanding your knowledge of the Whitetail Deer Hunt. I feel you can never have enough Whitetail Deer Information before going to the field. One thing I can't stand on these shows is the term they use after harvesting a deer. What a negative and degrading comment to make about the harvest of one of God's most beautiful and magnificent creatures. Along with the high fives, it also puts a totally negative image on our sport. Yes we are all very happy with a successful harvest and should celebrate by first thanking God and showing the harvested animal the respect it deserves. I ask everyone to only support those programs that show the proper respect for the Whitetail and other animals they show harvested. When did they ask the animal they just harvested to sign a contract. 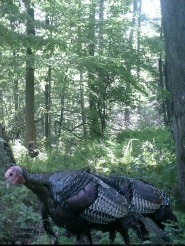 Below is a picture of a nice Tom Turkey and another one behind him off one of my trail cameras. I hope to see him again during Bow Season. Always make sure of your target before you take your shot. You have to pick your spot to place your shot so there is no excuse for any type of mistake in shooting another hunter. See our Anatomy section for proper shot placement. During gun season always wear a Blaze Orange Hat and Vest at the very least. Should you harvest a Whitetail Deer please take care of your harvest to insure great quality meat. Field dress your deer immediately. Hang your harvest by the hind legs to facilitate draining the remaining blood out of the deer. Skin the deer and butcher it the rest of the way. Do this ASAP. Do not leave the deer hanging for any amount of time as you can spoil the meat. Now that the season is in full swing remember to share your harvest with others. Remember those that have less than most of us. If you hunt on someone else’s land make sure you take care of their property. If you pack it in pack it out. Offer to help the landowner in any way you can they pay the taxes on the land you hunt on so be good to them. Best of Luck and make sure of your target and what is behind it. Always hunt safe. Make sure if you use a tree stand you wear your safety harness. 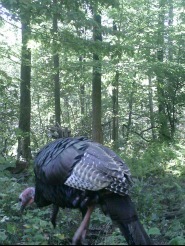 Below is a trail camera picture of a nice tom turkey walking by.